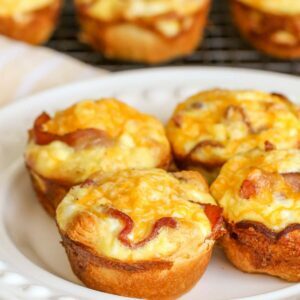 Simple Cheesy Breakfast Bites - a crescent roll bottom with eggs, bacon and cheese on top! The perfect bite size muffins for breakfast or brunch! Roll out crescent dough and press seems together. Cut into 12 squares. Grease pan really well and place 1 crescent square in each muffin cup. Place 3 small pieces of bacon along the sides of each muffin cup. Mix eggs, milk, ½ cup cheddar cheese, salt and pepper until well combined. Pour into each cup until ⅔ full. Sprinkle cheese on top and bake for 16-18 minutes.